32 pages; Dimensions 11.0 x 8.5 in. 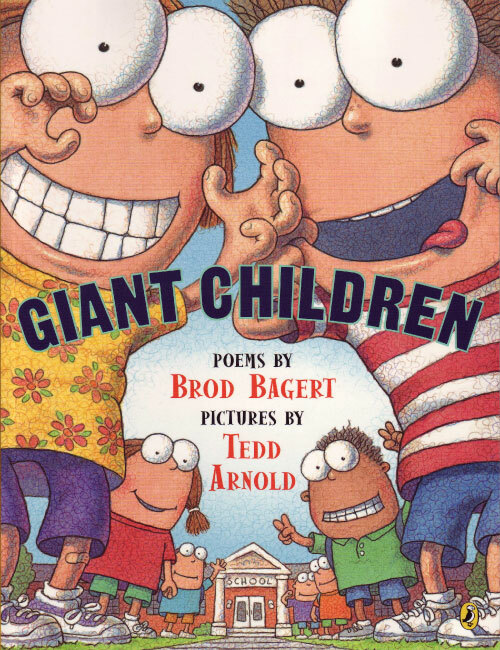 Giant children, a turtle named Jaws, goblins, boogers, and stinky boys--they're all here in this hilarious collection of poems. The delightful rhymes prompt point of view as they look at the world through a child's eyes with comical, cartoony artwork. This book builds reading fluency as children request repeated readings! This deliciously over-the-top poetry collection explores the nerve-wracking world of school-age children. The narrator of the opening titular poem is the classroom hamster: "Pages turn at giant speed/ As giant children learn to read." Bagert's (Chicken Socks: And Other Contagious Poems) uncomplicated style of verse addresses such diverse topics as sibling feuds and wild imaginations, monster trucks and the Tooth Fairy, as it humorously handles the more anxious side of growing up, including the mixed blessing of landing the lead in the school play. Arnold's signature style seems particularly well suited to the stage-frightened fellow waiting in the wings ("So here I am on stage,/ And the play's about to start./ My life was so much simpler/ Before I got this part"). The squiggling lines seem to indicate the actor's nerves gone haywire. Bagert delivers the requisite gross-out with "Booger Love" (complete with warning label that the poem "not, under any circumstances, be recited to a grown-up!"). The characters' pop-eyes sitting atop oversize heads help express the ever-changing emotions of childhood. Arnold selects just the right moment in each poem to dramatize and his exaggerated portraits help readers focus on the hyperbole of the poetry. A funny peek at the pleasures and (growing) pains of childhood. 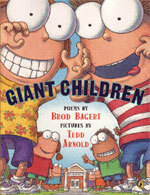 Determine from whose view point the "Giant Children" poem is told. Draw and write about a school event as viewed by the classroom hamster or other small observer. Brod Bagert was born on November 22, 1947 and raised in the City of New Orleans, where he studied the classics in Latin and Greek, wrestled and boxed to vent adolescent angst, fell in love with and married his high-school sweetheart, practiced law, served in public office, and reared four children that are the joy of his life. Tedd Arnold was born in Elmira, New York. He grew up on a farm in Pennsylvania for several years then returned to Elmira until Tedd was ten years old. His father's work then required that they move to Gainesville, Florida. There, Tedd's first art lessons in an abandoned dentist's office over the Happy Hour pool hall eventually led to a fine arts degree from the University of Florida. He and his wife, Carol, started their family in Tallahassee where Tedd worked as a commercial illustrator.